Ranch-style home in East Austin only one mile from Mueller, three miles to the heart of UT and ten minutes from downtown Austin. Master suite has ample room, granite counter tops, double vanity and a garden tub w/ separate shower and walk in closet. 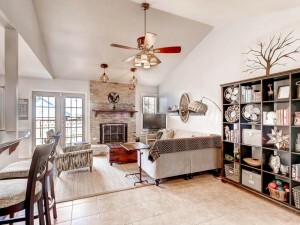 Open concept living room features vaulted ceilings, a gas fireplace and tile floors. Enjoy this kitchen which has stainless steel appliances, granite counters, custom cabinets, nice refrigerator, gas range, built-In microwave, and dishwasher. The butler’s pantry also adds ample storage and a dry bar with laundry room attached. The private back yard boasts a back deck with beautiful sunset views, a pea gravel patio, and an added storage shed. Updated lighting throughout the entire home, foundation, plumbing and HVAC were all replaced in 2007, new energy efficient windows, blown attic insulation and new roof all completed in 2015. Let this home bring you over to the East side! These owners are motivated to sell, so bring your offer soon!